They Say, "If the starting is tough; the rest is easy." Looking back, we clearly remember the number of obstacles we encountered while launching our first project - Vedika Exotica. But, it was a good learning experience. And today, when people consider it the best project in the twin cities of Ahmedabad-Gandhinagar, our heart fills with pride and joy. So far we have been focusing on luxurious homes. But now we intend to include residential and commercial complexes, 5-star hotels, IT-parks and townships into our fold. Every organization strives to leave an indelible mark, by contributing something worthwhile to its industry. 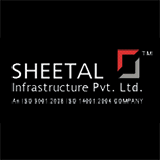 And Sheetal Infrastructure is no different. Our dream is to create the tallest building to dot the skyline of Gujarat. And if we continue to receive the kind of trust, support and cooperation we have till now, we are confident we can do it!